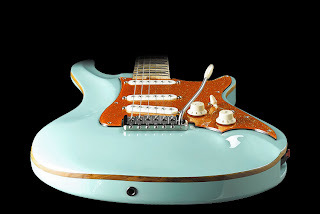 Although I've known about Warrior Instruments for awhile, I actually had no idea they built Strat-types. But their "Experience" S style models are some VERY SERIOUS STRATOCRAFT! So where have I been? 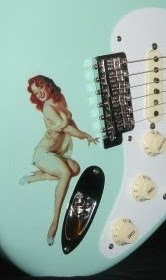 The Georgia based guitar maker is also creating some Hendrix tribute models in their S-type Experience series which include original licensed Hendrix art graphics. Although our featured model focuses on the inlays, others of the series display body graphics. I'm really diggin' this blue model though! Warrior's Experience guitars in general are made to order with a variety of wood, hdwr and electronics options available-- all hi-end stuff! Experience models are set-neck, and have unique carved body contours. Way beyond the usual, "We also offer an S-type to fill out our product line" thing. These folks are crazy into woods, and do beautiful work throughout their guitar and bass line.